So I was checking around the usual blog and news postings for something informationally entertaining about Office Supplies. As usual, there are lots of snooze inducing press releases about Staples doing something boring, and Office Depot doing something even more boring. Just as my eye-lids were about to close, I saw a whip built out of duct tape and had to mop up that little bit of drool off my desk left over from the press releases. I am not an expert on all offices everywhere, but I wouldn't technically consider this an Office Supply. Yes you can technically buy duct tape at a nice discount from just about any Office Supply Retailer, but I prefer to buy that kind of stuff from a building that smells like tires. Then I happened upon OfficeGuns.com. 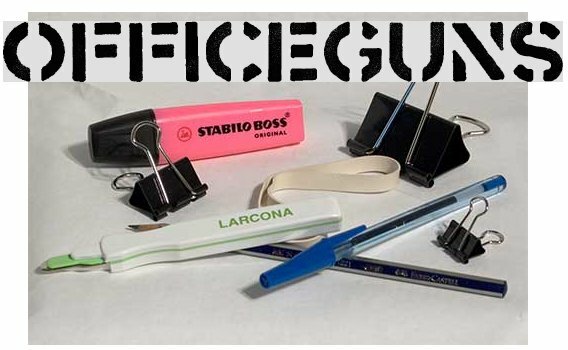 You'd probably want call me an Office Supply Poseur since it took me this long to finally stumple upon OfficeGuns, and you'd probably be right. While they do showcase a number of highly advanced guns you don't want to take anybody's eyes out, you just want to have some fun. So I suggest you stick to the Double Maul (named after the Mauly binder clips they like to use) for your inter-office warfare needs. Now unless you are friends with an international importer/exporter you won't have access to fancy German binder clips, but you can instead use normal binder clips. The Mauly 19 and Mauly 32 are nothing more than standard binder clips that are 19mm and 32mm wide. 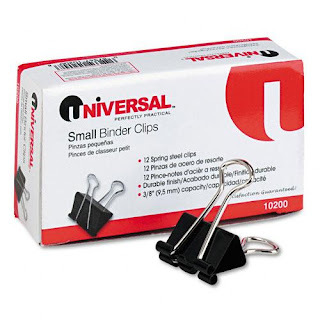 An easy alternative for the Mauly 19 is the Universal 3/4" binder clips, and instead of the Mauly 32 you can grab some Universal 1-1/4" binder clips. With low prices like that on binder clips, why not pick up enough to keep all your enemies at bay. After you've successfully built a Double Maul and used it inflict pain on your least favorite Graphic Designer, why not try out more of the Guns at OfficeGuns. Is a Paper Clip a Children's Product?